It’s only two days until the presidential elections in Iran, and it’s still unclear whether the vast majority of Iranians will choose to boycott the elections, or vote. The pro-democracy Green-Movement that emerged in the 2009 presidential elections has largely committed to boycotting the elections. But many are rethinking the boycott. With the surprise rise of moderate-cleric Hasan Rouhani as the reform-candidate, some Iranians are wondering if they should take a chance and throw their support behind him. To participate in the elections, however, would provide legitimacy to the political system in Iran that has barred most reformists and all critics of the regime from running, and resorted to ballot-rigging in 2009 to assure a victory for hardliner Mahmoud Ahmadinejad. The question comes down to whether Iranians want to risk having an extreme Khamenei loyalist take power like Saeed Jalili, or elect a reform-minded Ayatollah who may just be a sitting duck and provide the regime with a facade of legitimacy for even voting. Iran experienced its highest voter turn-out in 2009 with two reformists, Mir-Hossein Mousavi and Mehdi Karroubi willing to challenge and confront the regime’s oppressive rule bidding for the presidency. Reformists were convinced that the margins of victory for Mousavi would be so large that it could even overcome any ballot-rigging the government may have resorted to. The people underestimated the regime. After announcing the election results after a mere three hours of closing the polls, a process that normally took the minimum of at least a few days. Ahmadinejad apparently won 60% of the vote, and Mousavi less than 35%. Karroubi, in the most confusing polling numbers, won less than 1%, even a smaller amount when he first ran in 2005 and did not nearly experience as much popularity as he did in 2009. Iranians took to the streets enraged at the blatant ballot-rigging and demanded to know where their vote went. The regime shamelessly cracked down on protesters, killing some, and detaining the masses. It was not long before the Green Movement was subdued. After the outbreak of the Arab Spring, Mousavi and Karroubi were arrested after calling for Iranians to join the Arabs in solidarity, and too protest their own oppressive regime. The Iranians have since been living under surveillance, many of whom have been detained and tortured as a consequence of their anti-regime activities. Iran has created a monitoring system grander than the Shah’s secret police, the SAVAK were ever capable of. The regime’s technology advancement spans from Nokia mobiles that can pick up conversations from passerbys even when turned off, to all internet activity. Iranians who blogged and drew attention to the regime’s oppressive crackdown on its opposition abroad in their safe confines within Europe and the United States now fear to return home because of the potential–and likely–reprisals they may face. Virtually all political power in Iran has been monopolized under the clerical elite, led by the Supreme Leader Ayatollah Khamenei, and freedoms for Iranian more limited than ever as a result of the 2009 elections. Whereas the momentum of presidential elections in the United States stretches over the span of a six-month period, in Iran it’s the few weeks leading up to it, and in this year’s is seemingly the week of. The registration period to enter the presidential race ended in May, with a last-minute registration of former president Akbar Hashemi-Rafsanjani. Rafsanjani, at the behest of his successor the reformist Mohammad Khatami threw his turban in the ring, declaring that he would race without the Supreme Leader’s blessing. A powerful figure who already heads the Expediency Council, the intermediary between the Majles (Parliament) and the Guardian Council (who vets all legislation and candidates), many saw him as a threat to the ruling establishment because of his reformist-inclined platforms. He was barred, along with Ahmadinejad’s right-hand man Esfandiar Rahim Mashaei who many saw as being a placeholder while the current president pulled a Putin. All those running are strong Khamenei loyalists. This means that no one elected will challenge the Supreme Leader’s rule, although some may push for a slight balance in power. As it stands, three days from the elections, there are 6 candidates running. The conservatives running, or as they call themselves, the “principlists” are Mohammad Bagher Ghalibaf, Saeed Jalili, Mohsen Rezaei, and Ali Akbar Velayati. The moderates include Hasan Rouhani and Mohammed Gharazi. Principlist Gholam Ali Haddad Adel recently dropped out in order to strengthen his allies’ positions in the race. Reformist Mohammad-Reza Aref also pulled out at the insistence of reformist-leader Khatami, who believes that the reformist vote should be solidified behind Rouhani. The Guardian Council has publicly announced its deliberation on barring Rouhani from the race, after he supposedly revealed “nuclear secrets” during Saturday’s presidential debates. Or, more likely, for taking a much-stronger reform platform than the Council expected. While all the candidates are all loyal to the Supreme Leader, they stand differently on a multitude of issues. On the nuclear program, Jalili and Velayati have taken a strong position of “resistance” of western pressure to halt uranium enrichment, while moderates Rouhani and Gharazi advocate strongly for diplomacy with the US to resolve the nuclear-issue. Tehran Major Ghalibaf has said as President he would abandon any attempts to build a nuclear weapon, and also believes in more diplomatic efforts, although he, pragmatically reasoned that most of the foreign policy rests with the Supreme Leader. On women’s rights, most candidates agree there needs to be improvement in unfair policies toward women, but with varying degrees–While Rouhani has pledged to create a women affairs ministry, Jalili believes that women should continue to focus on being mothers. All candidates have cited addressing the country’s economic woes with be a priority. As is stands, Ghalibaf, Rouhani and Jalili are seen as the major contenders, and are leading the (unofficial) polls in Iran. The outcome of the 2009 presidential elections marked the climax of Iran’s crisis of political legitimacy, and many see a boycott of this Friday’s elections as a tool to further delegitimize the regime. The elections this year potentially could bring the lowest voter turn-out in Iranian history, and would be a scar on the already damaged Islamic regime. Whoever is elected as president in Iran will be known not to truly represent the Iranian people to the international community, unlike Ahmadinejad who could claim that the 2009 elections that drew over 70% of Iranians to the polls, and therefore he was popularly elected. It also reflects how Iranians do not believe in participating in an unfair system where the unelected institutions (the Guardian Council, Expediency Council, Judiciary, Supreme Council) have more power than the elected institutions (the presidency, Majles and municipal councils). Most importantly, it reflects their unwillingness to participate, and legitimize a political system that is increasingly looking like a religious theocracy where the Supreme Leader has the ultimate power. For many Iranians, boycotting is about preserving their dignity. After their vote went uncounted, discounted, and disregarded in 2009, Iranians do not believe they should again waste their vote. By not voting, they are symbolically voting against the regime. They are refusing to recognize the Supreme Leader as their supreme leader, and the president as their president. Dignity and pride are strong characteristics of Iranian people, and regardless that Iranians tend to be more politically conscious, they will boldly remove themselves from the only opportunity to participate in the political process out of respect for themselves. Most commonly, those who choose to boycott do so because they believe nothing will change as a result of the election. The presidency has virtually no power in Iran. This can be attested from Ahmadinejad’s term in office, where his talk was reduced to rhetoric, and all his actions were personally vetted by the Supreme Leader. The presidency lost all power and influence after Mohammed Khatami’s presidency from 1997-2005. After his brief attempts to liberalize Iran by opening Iranian society by lifting political restrictions on the press and organizations, the conservative-dominated Majles reversed all his reforms, and stonewalled any attempts throughout the rest of his presidency for anymore reforms. For many Iranians, the presidency is an obsolete position, a mere facade of an Islamic “Republic”. However, some Iranians in the Green Movement are rethinking boycotting the election. After Mousavi and Karroubi were put under house arrest, and subsequently barred from entering the race, in addition to Khatami refusing to accept the reform-ticket candidacy, there seemed to be no viable progressive candidate. The boycott has been called to question now that Hasan Rouhani has emerged with a reformist agenda. Following the release of his 30-minute documentary on his life story, and the four-hour tedious debates, the moderate, and only cleric running Hasan Rouhani has caught the attention of many reformists. The demography of his supporters reflect those of the Green Movement, and even a little more diverse–Young women adorning loose headscarves and heavy make-up, young men with tight jeans and shirts, as well as older duhuti (traditional) men and make-up-less women in chadors. His commitment to social and political freedoms including women’s rights has caught on. Khatami and Rafsanjani are only the latest major political figures to back Rouhani, and have been actively encouraging their supporters to vote for him as well. Rouhani, while a blessing to reformists is also a blessing to the regime–his presidential bid will undoubtedly boost the vote this Friday. Rouhani is no Mousavi, Karroubi, or Khatami. He is not well-known, has little track-record for advocating for governmental reforms, and most importantly is an ayatollah. He is a part of the religious establishment that has upheld the velalyet-e faqih, the rule of the jurist, or the Supreme Leader. But, as many Iranians will agree, he is the better alternative to an extreme, right-wing principlists Khamenei loyalist taking over the presidency. I’m talking about Saeed Jalili. Anyone but Jalili, has become the motto for reformists choosing to not boycott these elections. Jalili has been described as a “bogeyman” by the Guardian Newspaper . Although not an ayatollah himself, Jalili is arguably the most devout, and extreme of the list of presidential candidates. His doctorate thesis was called “the foreign policy of the Prophet”, which is likely to try to execute if in office. He has struck down notions to increase women involvement in politics, and most significantly, would be a mere extension of the Supreme Leader’s reign if in office. Anyone but Jalili. Perhaps the most noble reason for Iranians to not boycott the elections, is ironically pride and dignity. Even if the regime steals their vote, they will continue to vote over and over again. Democracy is a process, and the one way to ruin that for many of these Iranians is to boycott, and not vote. After all, considering the 2009 debacle that received international condemnation and delegitimized the regime to a point where people are wishing they never overthrew the Shah, how could they take the risk and rig ballots again? The fact that the Guardian Council so carefully vetted the candidates in this year’s election shows that any of the candidates are acceptable enough to be president in their eyes, and ballot-rigging isn’t necessary. Iranians’ votes may actually count in Friday’s election. I have dual American and Iranian citizenship, and I can technically vote for a presidential candidate this Friday. All it would take is a three-hour drive up to Seattle. If I were to vote, it would definitely be for Hasan Rouhani. Although it may seem like a vote for Rouhani is a vote for the religious establishment, if he follows through with his pledges to enforce personal freedoms, fix the economy and reconcile with western powers, it would mean huge benefits for Iran. If he fails on his reforms, either a lack of commitment or is stonewalled by the Guardian Council and the Supreme Leader like Khatami was, then Iran surely can’t get any worst than it already is. 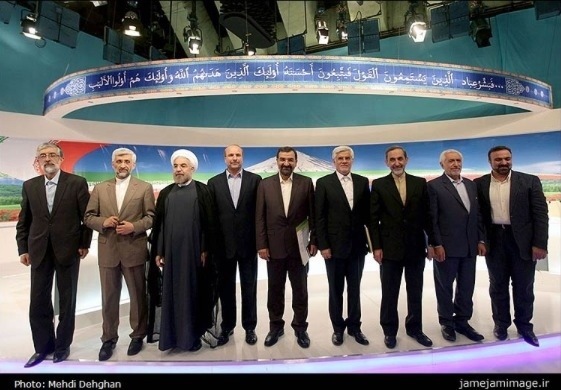 A Jalili presidency could however test Iran’s limits. However, political systems should invigorate its constituents. Citizens of a state should be excited, and inspired to vote and participate in the democratic political process. Considering that Iran has an especially robust civil society and an informed electorate, if people are not motivated to vote, it simply reflects the regime’s political legitimacy. There just isn’t that same momentum there was in 2009. My friends are choosing to boycott the elections. For me, I’m not choosing to boycott, or not to boycott. I just don’t feel impelled enough to make that drive to Seattle.